The Civic Centre Heritage Conservation District has nearly the same boundaries as our Olde Berlin Town neighbourhood. It houses a significant number of the designated heritage homes and historical character in the City of Kitchener, a city that was first established in the province in the 1800s. This section of the website was created for residents and other individuals interested in the history of Berlin (Kitchener) from settlement to present day. This will be updated as we add resources and links that are are available from the City of Kitchener, library collections, and the wider community. Property owners in the Civic Centre Heritage Conservation District can contact the Heritage Planner at the City of Kitchener with questions. The plan for this district is available on the City of Kitchener website as a PDF; it’s a wonderful resource for residents and local history geeks alike. If you have photos and stories from the history of Olde Berlin Town, we’d love to share them! 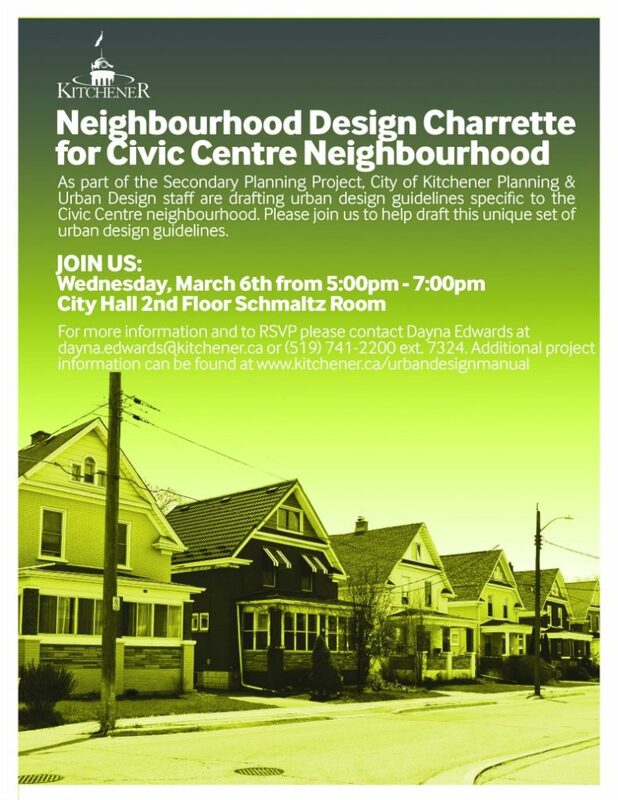 Quick reminder folks, that the UDM consultation is this Wednesday, 5-7pm, at City Hall (Schmaltz Room on the 2nd floor). We’ll be contributing to the creation of the new Urban Design Manual, a set of guidelines intended to complement the zoning by-law. We will also be contributing to a section specifically about Olde Berlin, that may need different treatment than other areas of the city. Your voice and opinions can help create a stronger document. For those looking for some photos of historical Olde Berlin, the website history pin has a number of photos of the Civic Centre.You can use the map feature to find them. • The Buildings of Canada: A guide to pre-20th-century styles in houses, churches and other structures.